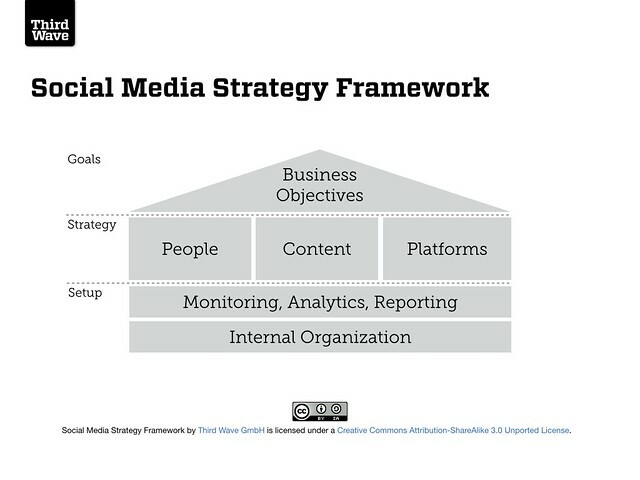 This series of articles describes our structured approach to developing social media strategies with our clients. Over the last few years, we have been developing our own approach to developing social media strategies. First individually at our former agencies and jobs, and then through the last 1.5 years together, this framework has been iterated numerous times and has grown a bit more mature with every client we’ve worked with. It has been informed by countless insights and inspirations from all kinds of folks in the industry and beyond. We now feel it’s time to publish our approach to give back and open it up for more people to improve and advance it. Use the PDF if you want to print the document, use MOBI for your Kindle and EPUB for all other kinds of readers and tools. The framework is meant as a guide, which helps us work through a process with our clients in a structured way. It tackles the questions, which help us define the answers that turn make up the strategy. No strategy makes sense without clear goals. What goals does the company want to achieve with the help of social media? What business metrics are the benchmarks for the strategy’s success? The strategy is developed to achieve the goals. Who do we want to talk with? What is there to know about them? About their interests, their goals, their lives, their behavior, etc.? What do we want to talk about? What are the topics and ideas? What is the added value that we want to provide on the social web? Where do we want to talk with them? Which platforms are the best for the people we want to reach and the content we want to talk about? A strategy needs to be implemented and constantly tested and improved. How can we listen to what people say about us and the topic relevant to us? How do we measure what our strategy achieves? How do we gain insight and improve our approach? Who is in charge of the strategy inside the company? What roles and teams need to be designated? What processes need to be in place? Which vendors need to be brought in? Throughout the coming weeks, we will publish in-depth articles on each part of the strategy. Reclaiming Social Media – Why are we doing it like this? Looking forward to future posts about this topic. Thx for sharing. Would be interesting to transform the framework into a running and self iterative process.